On Friday April 18 at 6pm, to launch the 2014 Santa Barbara County Wine Futures Tasting weekend, Les Marchands will host the Winemaker's Dinner. Unlike a typical gathering, our primary focus of the Winemaker's Dinner will be a harvest style celebration—bringing and sharing superb wines. This concept has been ongoing for generations throughout Europe but was formally organized in the 1920's by Count Lafon as La Paulee de Meursault...a celebration in Burgundy marking the end of harvest. Les Marchands has invited several winemakers to participate and in generosity they have agreed to bring along Santa Barbara County wines from their cellars—fun, unique, aged, new, unreleased, large format—the variety will be truly memorable. As part of this theme, we are encouraging guests to bring a wine from Santa Barbara County as well, to share with members around your table. Again, the evening is centered around sharing, enjoying, and learning about the expressive wines of Santa Barbara County. 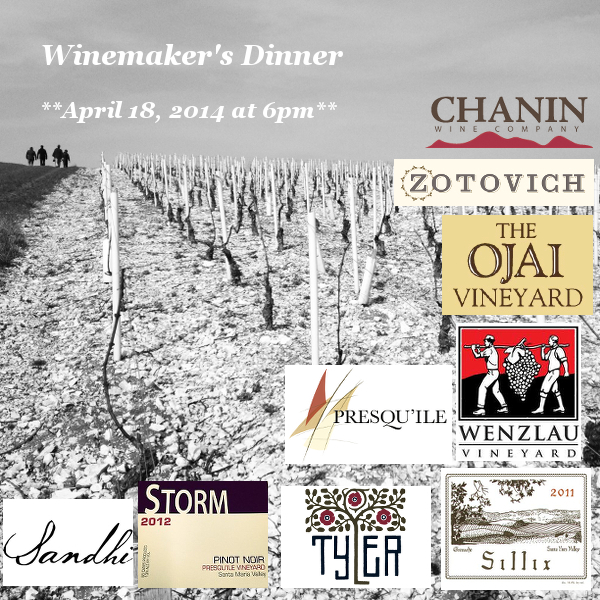 Confirmed winemakers and proprietors attending include Zotovich, Ojai, Tyler, Wenzlau, Sillix, Chanin, Storm Presqu'ile, and Sandhi…with a few more in the works.